“Hello, my name is William Horsky Jr. I am the founder, owner, and now President of Professional Plumbing, Inc. Professional Plumbing was started back in 1985 when I got my first truck and was working out of my garage 50in Huntington Beach, CA, as a sole proprietor. I had been working for several other plumbing companies as a journeyman and then as a master plumber. I got tired of how the plumbing companies I was working for were treating and charging their customers. I felt it reflected on me, personally. I knew I could give my customers better service, at a better price, and still make a living. “So, off I went to start my own plumbing company. I was very lucky while I was looking for a name that would state what I was trying to provide to you, my plumbing customer. Just as I was looking, I found that an old plumber was using the name “Professional Plumbing” and had moved to San Diego to hang up his plumber’s tool belt. He said I could use the name Professional Plumbing as long as I was a good plumber. “It didn’t take long for people to see the value we were offering. The name Professional Plumbing quickly became synonymous with high-quality plumbing, excellent workmanship, and fair prices. We grew into two trucks and many more customers. Word of mouth was traveling fast. You can’t buy that type of advertising, and it is still one of our excellent sources of new clients needing plumbing repairs. So, thank you to all those who have helped pass the word and help grow our business. “Trying to find good plumbers is always a difficult task. We were fortunate in 1993 when Nick Haas joined our plumbers and then the Professional Plumbing, Inc. team. He is such an excellent, quality-minded plumber that we made him the field supervisor of the plumbers’ service department. “In 1997 we were too big to stay as a home based business and moved our office to Fountain Valley, CA. We expanded our plumbing services and started doing the plumbing for Custom Homes and had already been working in the commercial plumbing areas with accounts like Seal Beach Weapons Station, ITT Cannon, Orange Coast College, Golden West College, OC Register, just to name a very few. Staying with the basic principles of providing great customer service and great value to all our plumbing customers fueled our continued growth. My sister, Liz Barton, came on board to take care of the office and scheduling of the plumbers. She has been doing a great job interacting with the customers and keeping the plumbers on their toes. When you call in, she is the one that usually answers the phones. 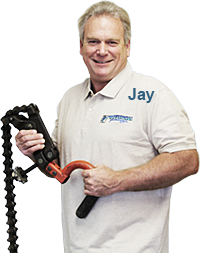 “In 2001 we incorporated and became Professional Plumbing, Inc. Since then we have survived some of the most challenging times in recent history. All this due to our plumbers making sure you, our customers, are 100% satisfied, 100% of the time. The capable technicians at Professional Plumbing, Inc. are ready to assist you with a wide variety of plumbing services, from basic plumbing like drain services to slab leak repair in Riverside, CA. Contact our team today when you need an experienced plumber in Corona, CA, or any other type of plumbing service.